Moving to the Universal Journal – How does the “New G/L” Fit In? 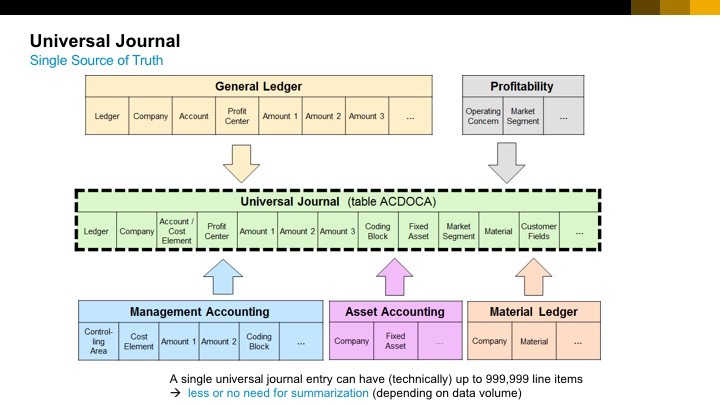 Welcome to the Universal Journal – your one-stop shop for financial information in SAP S/4HANA Finance! With SAP S/4HANA Finance, the Universal Journal is one large table that consolidates transactional information that was previously stored in multiple tables. It consolidates the General Ledger tables; sub-ledgers such as accounts receivable, accounts payable and fixed assets; controlling tables such as cost center, project and internal order data; and the material ledger and account-based profitability analysis. It also includes operational information such as customer and product IDs for more granularity in financial reporting. One of the benefits of the Universal Journal is that the same table is used for both transactional processing as well as analytics, leveraging the in-memory technology of SAP S/4HANA. That means no more waiting to reconcile to totals tables, or to replicate information into a separate analytics system. Meaning that Finance executives and teams can respond more quickly to inquiries about the financial implications of business decisions. One question that comes up frequently is whether it is necessary to upgrade to the “SAP General Ledger” (also known as the “New G/L”). The short answer: the New G/L is not a pre-requisite to move to the Universal Journal. Parallel ledgers, which support multiple accounting standards, for example IFRS as well as country-specific GAAP (Generally Accepted Accounting Principles) for financial reporting. Standard reporting for these parallel ledgers in the SAP General Ledger. This is a benefit since in the classic ledger, parallel ledgers and reporting could only be accomplished using the special purpose ledger, where all reports needed to be created for each special purpose ledger during an implementation. Online document splitting in the SAP General Ledger enables the creation of financial statements such as balance sheets and income statements for business segment reporting, not just t the legal entity (company code) level. Real-time integration between the FI (finance) and CO (controlling) modules for postings that occur across company codes, functional areas and business areas. If you are moving to the Universal Journal, there are two scenarios. If you are running the Classic G/L, you can choose to implement the New GL first, which is usually undertaken as a separate implementation project. Afterwards, you can then migrate to the Universal Journal. Alternately, you can move directly to the Universal Journal from the Classic G/L. In this scenario, there is a technical upgrade to the New G/L, which happens in the background, but it is not necessary to first migrate to the New G/L and implement the features that are available. You can then implement these features, such as parallel ledgers and document splitting, after you have moved to the Universal Journal. 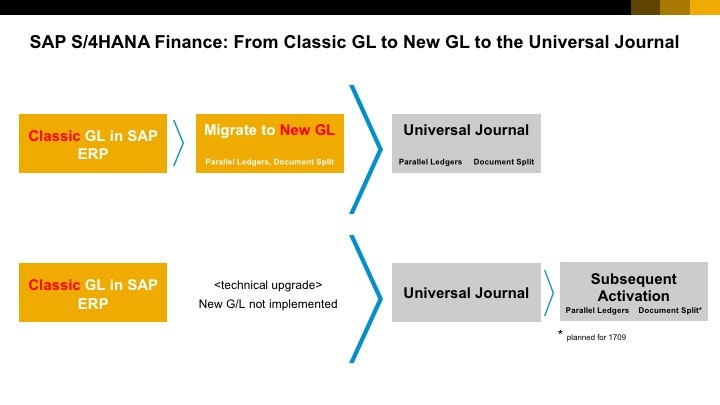 The most important take-away is that you can implement SAP S/4HANA Finance, with the Universal Journal, without needing to do a functional upgrade to the SAP General Ledger (or the “New G/L”). First I say thank you for the wonderful explanation and video. Q. Is it not required of any migration ( including sub-modules (G/l, AR. AP,AA ) ) although SAP has provided a lots of steps of migration ? Q. How the values are updated and posted in respect of different / parallel ledges and parallel currency ?